Nanotechnology is the basis for the next industrial revolution. We have several samples of successful business cases e.g. at chemical industry. Nanotechnology is everywhere, in our clothing, cars, windows, computer and displays, even in our cosmetics and medicine adding new functionalities, intelligence, integrations, portability and networking capability in many new products with high market potential. Nanotechnology is the key to markets worth billions of dollars annually. Nanotechnology helps Europe to address global challenges such as climate change, constraints in energy production and shortage of resources, insufficient access to clean water and food safety, as well as widespread diseases and affordable health care worldwide. However, the true potential of nanotechnology is not yet exploited exhaustively. NANOfutures brings together industry, research, networks NGOs at all levels for a joint movement towards a new industry. 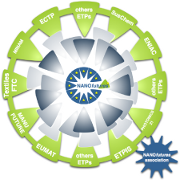 NANOfutures environment is an ETIP European Technology Integrating and Innovation Platform, multi-sectorial, cross-ETP, integrating platform with the objective of connecting and establishing cooperation and representation of Technology Platforms that require nanotechnologies in their industrial sector and products. NANOfutures and its operative branch NANOfutures association act as a “Nano-Hub” by linking JTIs, associations, ETPs with expert groups in a collaborative environment. NANOfutures at its base is open to industry, SMEs, NGOs, financial institutions, research institutions, universities and civil society with an involvement from Member States at national and regional level. It is an environment where all these different entities are able to interact and come out with a shared vision on nanotechnology futures. NANOfutures collaborate with the ETPs on the basis of a Memorandum of Understanding. NANOfutures identifies the key nodes in strategic nano-activities and develop strategies to address nanotechnology challenges with an intersectorial approach. This is achieved by a close interaction between horizontal working groups, which address cross-sectorial horizontal issues, and sectorial group representatives (i.e. ETP representatives). Working groups are organised under the 3 main topic areas addressed by NANOfutures: "technology", "regulation and standards" and "innovation". Objectives of the horizontal working groups are to present recommendations for strategic actions under each of these three main topics. Nowadays, there is a huge amount of information around nanotechnology coming from the active stakeholders and various initiatives. In this complex environment there is a clear lack of an intersectorial view defining the key nodes of strategic nano activities, including the needs of society, policy and environmental issues (what is “Responsible Governance of Nanotechnology”) allowing to optimise and maximize the impact of resources deployed, avoiding duplicated, disconnected and fragmented actions and operating, in general, under a single-reference-responsible capable of communicating with the general public and political institutions and actors at all levels (local, regional, national, European and worldwide). 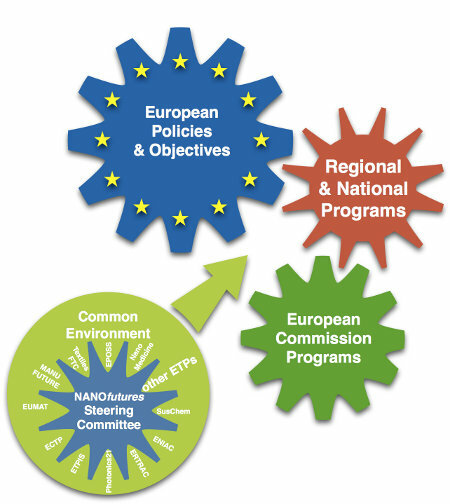 In order to support European industries successfully profit from nanotechnologies a number of issues needs addressing: Involvement of general public and clear orientation of all undertakings to bring benefit to the community; Fragmentation of research and innovation efforts due to the interdisciplinarity and complexity of nanosciences; The need for a converging approach requiring interactions between life sciences, chemistry, microelectronics and other sectors; The differences between the regions in Europe. All this calls for a different approach for exploiting these new technologies. 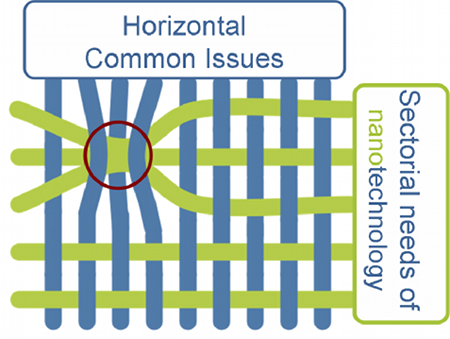 There is a need for clear market drivers – examples of high profile industrial problems that can be demonstrably solved by applying nanotechnologies - if nanotechnology is to develop from an enabling technology to an end product. Industrial foresight needs to build on established as well as new companies ready to pursue the potential. Finally, public perception is crucial. A pre-cautionary approach to safety issues and clear communication is needed. These are all barriers to commercialisation that can only be effectively addressed through an integrated, cross-platform, collaborative approach: the NANOfutures initiative.